Lia reminded me a bit of Princess Merida from Brave, though that may be because she has fiery red hair and can wield a bow. She is strong, brave, intelligent, caring, and determined to help her family at any cost. Her knowledge of herbs and their uses in healing was really interesting to read about – especially the lore surrounding the trees and their associated passages in her Grandma’s Grimoire. Throughout the story, Lia is challenged in various ways, resulting in increased confidence in her ability to solve problems and the discovery of new powers. There were many creative, magical aspects to this book, but they were never elaborated upon. We only got a glimpse of village life before Lia was swept away to Brume for a quest, and the setting continued to rapidly change. A few pages were spent in the village, a chapter was spent with dwarves, and the rest of the book was spent amongst the trees and magical creatures that inhabited Brume. We were never given a sense of culture, and many important concepts – such as why the leaders refused to believe in magic and shunned the “old ways” – were glossed over, leaving many questions left unanswered. The secondary characters were fun to read about, but they fell flat next to Lia. There was no character development, as the few traits that they exhibited remained unchanged throughout the book. This may be due, in part, to the fact that the story is told in a third person narration, which doesn’t allow for much connection with the characters. They seemed only to exist in relation to Lia, causing several of her relationships to lack emotional depth and believability. 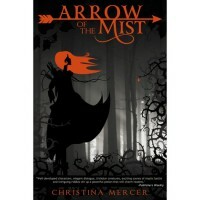 Overall, while I enjoyed the concept behind Arrow of the Mist, there was much to be desired in terms of its execution. That being said, it was an okay start to the series and I’m curious to see how the second book plays out.